Lack of control: One of the primary reasons why Content Management Systems may fail occurs when there is a lack of central editing control, resulting in varying styles of writing and delivery across the site. While CMS may provide tools for central control, they are not always applied or used appropriately and may require someone with adequate editorial experience. Contribution: It is not unusual for features in a CMS solution to go unused. This may be because some users do not think that specific applications are necessary, or that they do not contribute to the website. The site needs to be seen as a critical business tool that can be utilised efficiently and effectively by a company. If it does not meet the need, it may deliver, at a cost, features that contribute little. Unfocused Call to Action (CTA): A CMS solution should aim to improve the business, but with no clear call to action users remain unable to fulfil their needs. The website needs to cater to its expected market and encourage users to engage with the content in a meaningful way. Implementation: A majority of CMS promises' revolve around creating innovative websites. However, the company and its users must be able to make use of these innovations and ensure that they are relevant to both their long and short-term strategies. Ultimately, the successful implementation of a CMS system relies on a comprehensive plan and realistic strategies. 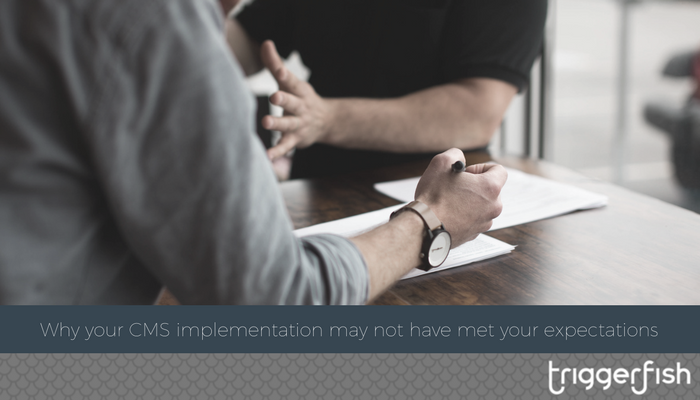 Companies who have encountered a failed CMS project, or who wish to avoid one altogether, should look to engage an effective implementation partner. A good implementation partner will be able to perform a project rescue, assessing with the existing project’s needs, discovering what went wrong, where, and why to find an appropriate resolution. They will also be able to ensure that projects remain relevant and on track; and that the needs of the organisation and their users are adequately addressed. If you are interested in resolving your CMS concerns or wish to start a growth-oriented CMS journey, get in touch with a Triggerfish consultant. With experience delivering successful growth-driven designs, and the ability to help businesses realise their potential, we can help you get results fast. Get on the line today.